Chicken Soup for the Soul is full of short stories shared by people all over the country. Chicken Soup for the Soul – What I Learned From the Dog is full of stories about dogs. There are over one-hundred shared such stories and each more moving than the last. Several of the short stories I read stand out. One of the first stories in Chicken Soup for the Soul – What I Learned From the Dog was about a dog who reminds me of Sephi. The dog pretty much keeps to himself most of the time. He doesn’t care to be petted and doesn’t do the happy greet that many dogs do when the owner’s come home. That is very much like my Sephi. And what did these owners of this dog learn? The same thing that I learned – like people, every dog is different and can be loved for their own special qualities. I also read a story in Chicken Soup for the Soul – What I Learned From the Dog about a little girl who was walking by herself after dark. On the way, some men in a car tried to entice her to get in with them. Out of the blue, a big dog comes along and walks the girl the rest of the way home. The men left and the little girl was safe. That little girl never saw the dog again. Was he heaven sent? 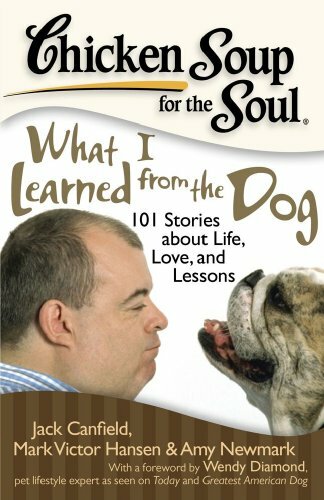 Some stories in Chicken Soup for the Soul – What I Learned From the Dog did not start out so well. A woman inherits a dog from her mother who just passed away. The dog is big hassle and the woman considers giving her away. But something happened over time. It turns out the dog was having just as much trouble coping with the death of his owner as the daughter was coping with the death of her mother. They bonded through mutual grief and built a loving relationship. My favorite story in Chicken Soup for the Soul – What I Learned From the Dog is the story about the homeless man. He is at the lowest point in his life and contemplates suicide. The only thing that saved him is the thought of leaving his two little Shih-Tzu dogs behind to fend for themselves. All though this Shih-Tzus did not pull him out of the river, they saved his life nonetheless. Dogs can teach us many things. The stories which stood out the most show how dogs teach unconditional love, patience, forgiveness, discipline, positive outlook, and the joy of giving. Reading Chicken Soup for the Soul – What I Learned From the Dog made me think of my own dogs, both present and past. There is no doubt that dogs do something special for us.